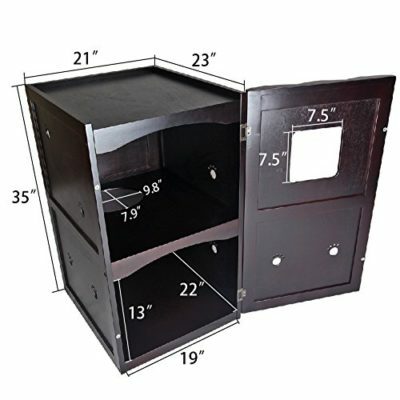 Petsfit Cat House & Litter Box Enclosure Review - Do Cats Like This Unit? 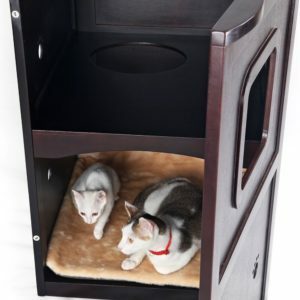 Petsfit Pet House and Litter Box Enclosure it’s a double-decker piece of furniture made from wood that offers you a solution to hide the litter box and provide your cat a hiding place. The unit is a good solution for reduced spaces and for homes with dogs and cats due to its design where only the cat can access the pet house. Petsfit is versatile, can be used as pet house, litter box enclosure or feeding station. Warranty: Within 30 days the Manufacturer takes full responsibility if any quality problems. Petsfit is made from MDF (Medium-density fibreboard) and pine wood. The unit is painted with a non-toxic paint called nitrolacquer. The inside of the unit has a double-decker where you can place the litter box at the bottom and the cat food on top or other items. Also, you can use the Petsfit as a cat house. The panels feature paw shaped vents where your cat can also see through. 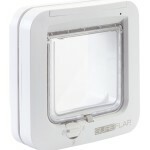 Petsfit features a latched front door that opens to access the inside. The assembly goes by tongue and groove with screws that fit smoothly into the pre-drilled holes for a secure and strong construction. The unit can’t be exposed to high temperature and sun exposure. 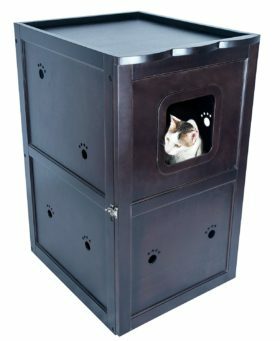 You can use the Petsfit as litter box enclosure or cat house. Your cat will access the unit jumping through the opening door located on the top level. To access the bottom your pet goes through a circle-shaped hole in the middle layer. To exit, your pet needs to jump up to the top level and then exit through the cat door. In the first layer, you can place items such as cat food bowls or water bowls, toys, bedding, etc. At the bottom, you can place the litter box or just place the cat bed. The latch is functional and decorative, closing the door smoothly. It can be difficult to assemble by yourself but with the help of somebody else to hold parts, it’s a breeze. Leave the door opened the first week to let your cat get used to the unit. The bottom is not waterproof. 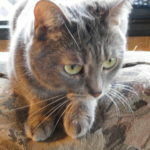 If you have a cat that has litter box accidents, make sure to caulk the bottom and get a high sided litter box, placing a litter mat at the bottom. If your cat doesn’t jump you can place a ramp to facilitate your pet the access. If you think the middle layer is too slippery for your cat, get a piece of bunk carpeting to place on top, making an opening on it to match with the hole. 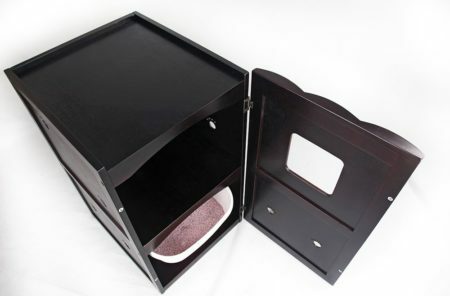 Petsfit Double-Decker litter box enclosure is an excellent piece of furniture that will provide a good solution to hide your cat’s litter box and provide a place for your pet to hide or eat, both at the same time. The unit is attractive and much bigger than how it looks in the pictures, make sure to read the dimensions before ordering. I recommend this unit for cat owners and especially for homes with a dog and cat. You can check more cat enclosure reviews for a wide variety of designs and styles.